SparkPlugs® for the PlugStation® - 6644 250 PAIR PER REFILL Soft comfortable fit. SparkPlugs® earplugs are made of extra-soft, extra light foam. Their tapered shape fits easily in the ear canal, and seals gently and snugly without pressure. Theyre so comfortable youll forget youre wearing earplugs. Independently tested: NRR 33. 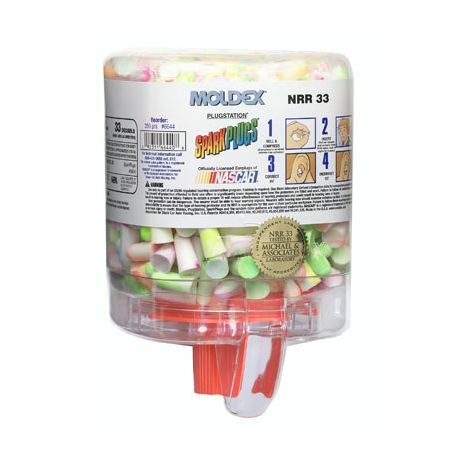 SparkPlugs® earplugs offer a high NRR 33, making them suitable for most noisy environments. So, while they look like fun, they provide serious protection. Our track record is perfect for NASCAR®. Random multi-colored swirl make for winning compliance to your hearing protection program. 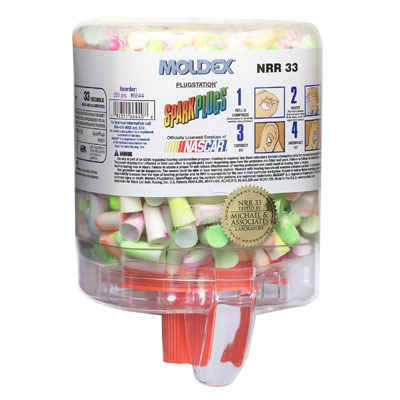 When it comes to comfort and compliance, nobody beats Moldex® to the finish line. Features • 100% PVC-Free. • Highest independently tested NRR. • Extra-soft, low-pressure foam for comfort and fit. • Tapered shape for easy insertion and removal. • Shaped to fit even very small ear canals. • Non-irritating smooth surface. • The bright green color is a trademark of Moldex-Metric, Inc. and also provides easy compliance checks.